Fontelle N. Jolly appeared in Geary County District Court Thursday. 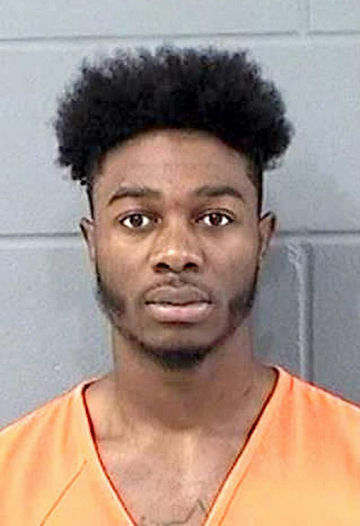 Jolly has been charged with the murder of Felix Snipes and the attempted murder of Cartavius King in relation to a shooting that occurred on Aug. 31, 2018, in Junction City. But Geary County Attorney Krista Blaisdell called witnesses to the stand Thursday in relation to an alleged incident that occurred on June 13, 2018. Blaisdell called William Lemieux, Emily Azbarea and Daniel Henry as witnesses during the hearing. Azbarea and Henry have been in a relationship since August 2017, according to Azbarea, and the two were at Lemieux’s Junction City apartment near Parkside Drive on June 13, 2018. When they departed the apartment, Azbarea said she was in the street when she saw a car approaching. “A Nissan Altima drove by, and my boyfriend told me to get on the sidewalk so I wouldn’t get hit,” Azbarea said. Henry said he recognized the driver of the car as Jolly, who he had previously lived with. Azbarea said the car stopped in front of Henry, who said Jolly then pointed a black and silver gun at him. Henry said he and Jolly had some bad blood between them, and that their living arrangement did not end well. Azbarea said she saw the black and silver gun as well. After pointing the gun at Henry, she said Jolly pulled over. The couple called the police, and Junction City police officer Kyle Hagen responded. Hagen was also called as a witness Thursday. He said he responded to the call at about 7:20 p.m., then went to Jolly’s residence after 10 p.m. He arrested Jolly, and searched his residence, he said. Hagen presented the gun and ammunition as evidence Thursday. Attorneys are expected to call additional witnesses in the case. Jolly’s next hearing is scheduled for May 16 at 1:30 p.m.